In case you were worrying that this most popular of apple varieties was named as a marketing stunt, you can relax now. Granny Smith was real. And she was really cool. 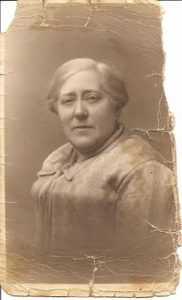 Maria Ann (Windsor) Smith, who was born in England in 1799, emigrated to Australia with her husband, Thomas, a farm laborer, and their five children, in 1838. They built a successful farm and orchard, and had another child. They may have been illiterate. There are several colorful stories about Maria’s discovery of a new apple, a mutation that occurred in a cross between a crab apple and a domestic apple. What is not in dispute is that she was 68 at the time, her husband was an invalid, and she did the work to both cultivate and claim the new variety. Smith died two years later; so did not get to see the success of her apple. Because it kept well, was slower to turn brown, and was excellent for cooking, it quickly gained international popularity. By 1975, 40 percent of Australia’s apple crop was Granny Smiths. Because the Granny Smith was a mutation, the seeds grow into a more tart apple with less appeal. So most apples are direct descendants of the original Smith tree. Australia celebrates with an annual Granny Smith festival, complete with Festival Queen and fireworks.